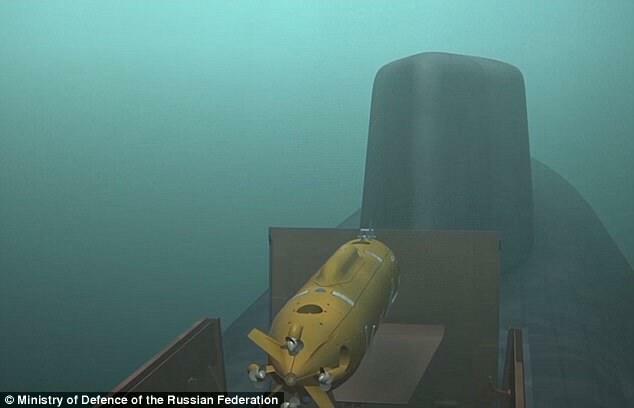 Russia is developing an underwater drone that can carry a two megaton nuclear warhead capable of obliterating Western ports. The Kremlin's Poseidon torpedo sub is designed to destroy 'enemy navy bases' and will be able to travel at up to 70 knots. 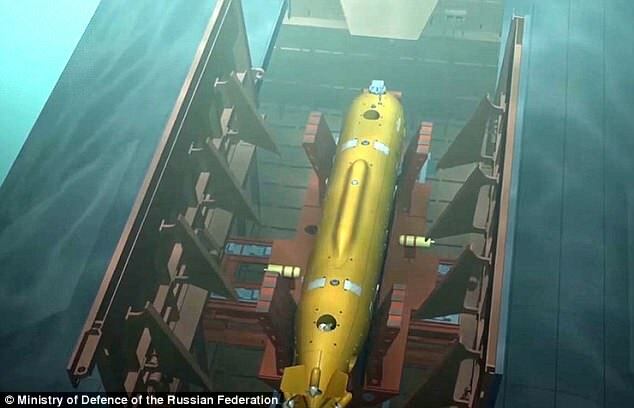 President Vladimir Putin announced plans for an underwater drone in his state-of-the-nation speech in March, in which he boasted of an array of new nuclear weapons 'invulnerable to enemy interception'. Russian state news agency TASS says it has not been able to confirm details of the weapon. With its nuke, the weapon 'is primarily designed to destroy reinforced naval bases of a potential enemy,' the report added. 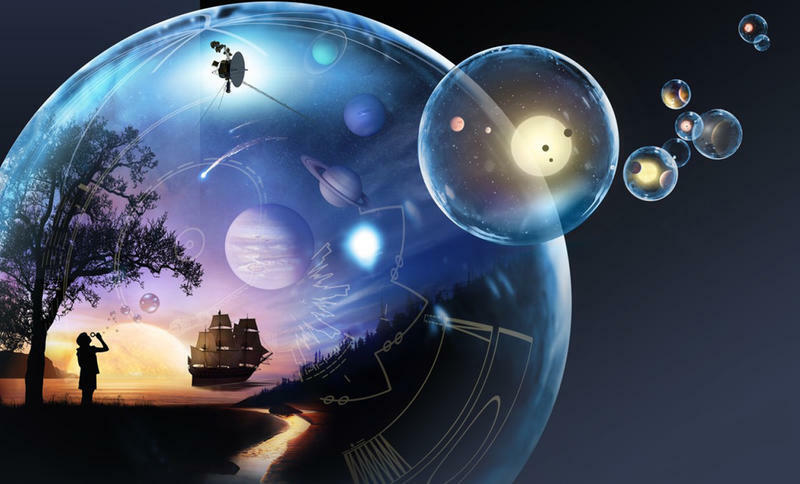 In March, Putin announced that Russia has tested an array of new nuclear weapons 'invulnerable to enemy interception' in a speech where he praised scientists behind the arsenal as 'the heroes of our time'. 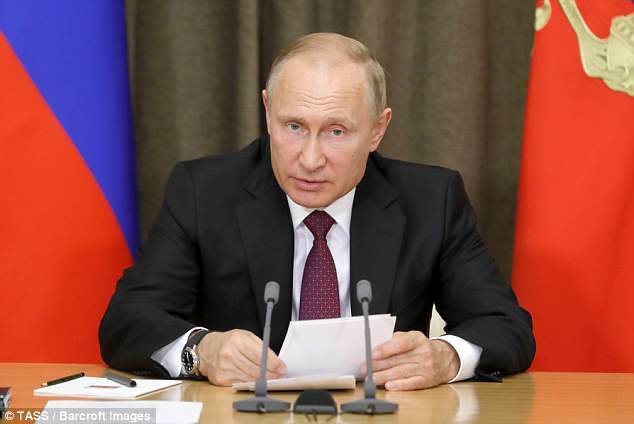 In his annual state-of-the-nation speech in Moscow, Putin said the weapons include a nuclear-powered cruise missile, a nuclear-powered underwater drone and new hypersonic missile and showed video footage the launch of a new heavy intercontinental ballistic missile on big screens. The video footage also contained a computer generated sequence showing the potential power and reach of the new rocket, which included bombs raining down over the U.S. state of Florida. During his speech, Putin said the creation of the new weapons has made NATO's U.S.-led missile defense 'useless,' and means an effective end to what he described as Western efforts to stymie Russia's development. It comes amid continued heightened tensions between Putin and the West over his role backing Syrian dictator Bashar al-Assad. Diplomatic ties between Britain and Moscow have plummeted in the wake of the poisoning of former Russian spy Sergei Skripal and his daughter in Salisbury. hey putin, do me a solid please and try not to blow up the port of los angeles.